There's not many who aren't suckers for a good pun in the beer world, with the residents of Crafty Towers among those susceptible to a bit of wordplay. So, hello to the punsome winter seasonal for 2018 from Hawthorn, a beer debuted in draught form at March's Good Beer Week Gala and now back in bottles. 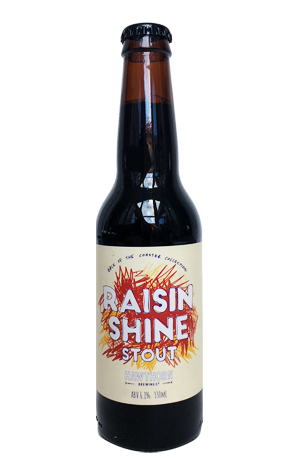 It's the first release in their "Back of the Coaster" series and comes with a title that hints at two of its ingredients: raisins and coffee, with the former added twice – first on their own into the mash, then into the fermenter after soaking in said coffee. Deep brown in colour, the coffee comes across as fruity, lightly roasted beans, accompanied by dark chocolate on the nose, with the dark fruits more apparent once you've taken a sip. The fruitiness is such we wouldn't be surprised if there's some English hops in there too, while it's pretty light on the palate for a beer at 6.1 percent ABV and boosted by a hefty dose of oats – a result, perhaps, of the gentle tang added by the specialty malts and the raisins.